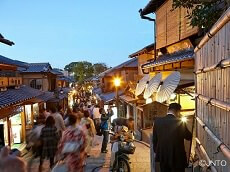 Kyoto's Gion Festival, the festival for the Yasaka Shrine, is the most famous festival in Japan. It takes place over the entire month of July. 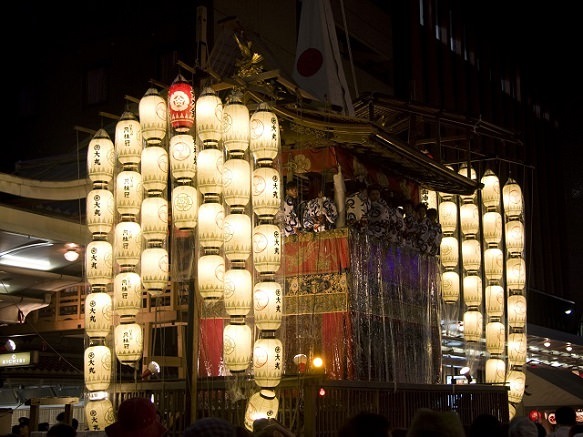 There are many different events, but two are particularly renowned: the Yamaboko Junko, a procession of floats on July 17th; and Yoiyama, the festive evenings preceding the procession. On the 17th, the 32 Yamaboko are called moving art museums and feature gorgeous, luxuriously-equipped items as they parade through the city while traditional music is playing. The word Yamaboko refers to the two types of floats used in the procession: Yama, of which there are 23, and hoko, of which there are 9. 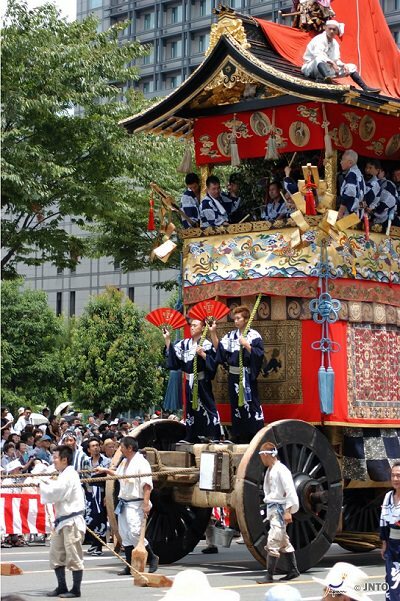 One of the main reasons the Gion Matsuri is so impressive is the solemnness of the hoko, which can be up to 25 meters tall, weigh up to 12 tons, and are pulled on wheels as big as people. 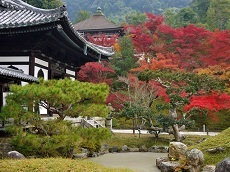 Both yama and hook are elaborately decorated and represent unique themes or stories. Another reason for the festival's impressiveness is its long and almost uninterrupted history. The festival is said to originate in 869 as a religious ceremony meant to appease the gods during the outbreak of an epidemic. Even today, the festival continues the practice of selecting a local boy to be a divine messenger. The child cannot set foot on the ground from the 13th until after he has been paraded through town on the 17th. 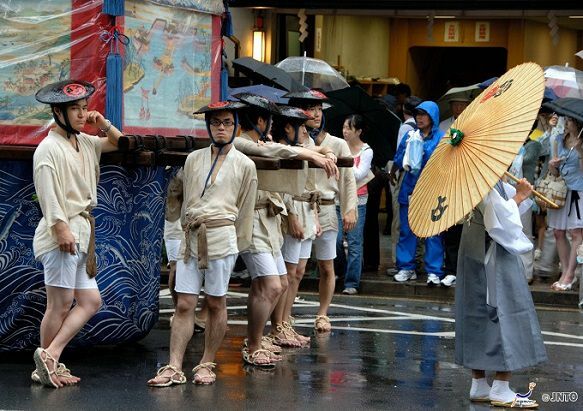 Ironically, the highlight events of Gion Matsuri do not actually take place in the Gion district, but rather on the opposite side of Kamo River. From the 14th to the 16th, the yama and hook are displayed within about a half kilometer of the intersection of Karasuma and Shijo streets. While they are on display, some of the floats can be entered by tourists. The display area becomes most exciting during the evenings, when from 18:00 until 23:00, the streets are closed to traffic and the area swells with food stands, drink vendors, and other festival hallmarks. 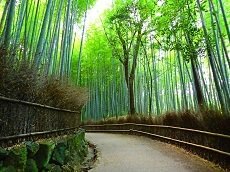 These festive evenings leading up to the procession are known as Yoiyama (July 16), Yoiyoiyama (July 15) and Yoiyoiyoiyama (July 14). 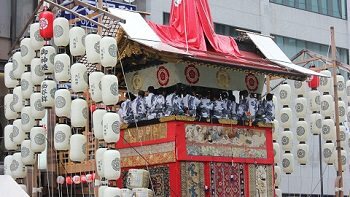 The procession of floats (Yamaboko Junko) takes place between 9:00 and 13:00 on the 17th and follows a 3 km route along Shijo, Kawaramachi and Oike streets. Some paid seating is provided in front of the city hall (3100 yen; advance booking required), but because the procession takes place over quite a long route and duration, good viewpoints can also be found elsewhere without too much trouble. Gion Matsuri's other events are not quite as impressive, but also enjoyable. From July 10th to 14th, for example, visitors can watch the assembling of the floats. 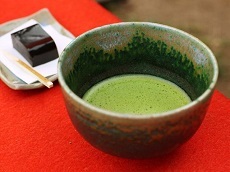 The Byobu Matsuri, which coincides with the days of Yoiyama (July 14-16), involves local residents opening their front doors and exhibiting family heirlooms to passersby. 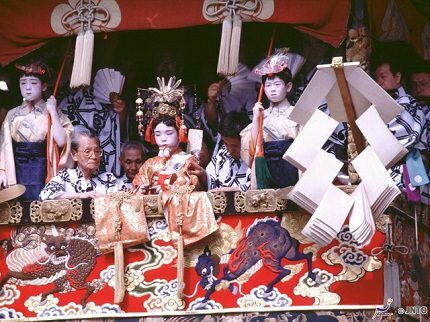 The procession of mikoshi takes place from 16:00 on the 17th, starting at Yasaka Shrine and ending at the Otabisho. 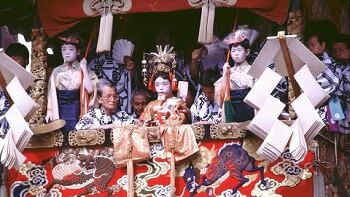 The event involves carrying the shrine's deity out of the shrine grounds and through the town in a mikoshi, a portable shrine, which is set on wooden beams and carried on the shoulders of local men. 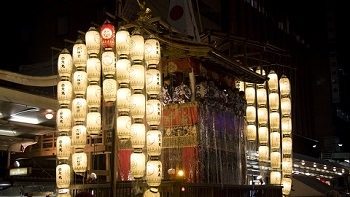 On the 24th, the mikoshi is returned to the shrine. 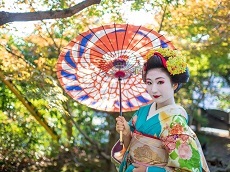 You can join in the festivities during July with any of our fully-guided Gion Festival Japan Tours & vacation packages available in the summer!